Home > Seafood Appetizers > Crab Meat, Shucked Oysters, Calamari... > Calamari Rings! Pt. Judith Calamari is hands down the Finest Calamari Available! Our Hand Cut Domestic Atlantic Calamari rings, caught by local fisherman is great for pastas, appetizers or what ever you choose! 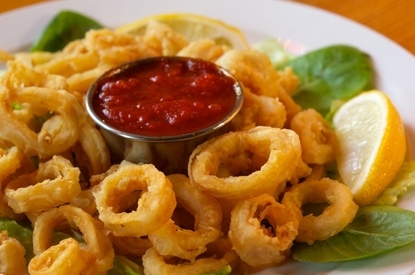 Our Calamari is used by fine Restaurants and Chefs around the country! Calamari Rings are fully cleaned and sliced, ready to be used in your favorite recipe! Atlantic Calamari Tubes • Calamari Rings! • Large Atlantic Squid! Our Locally caught calamari is very versatile and can be served in a variety of ways! Over pasta, or fried calamari, the choice is yours! It's the choice of Top Chefs and Restaurants around the country! Order Your Calamari By 10am EST, And Enjoy It For Dinner Tomorrow! Our Appetizers Also Make A Great Gift Idea For Your Favorite Seafood Lover! How Easy Is That! Excellent Squid rings! My wife made a big patch of old fashioned suated calamari, some Giovanni, and a pasta sauce! Ity was all fantastic! MUCH better than what you can find in the supermarkets! We enjoyed the calamari very much. We made fried calamari with hot peppers, and it was a big hit! Glad we found you online. This squid was really good quality, and cooked up great.